Huma Siddiqui returns to the library for another live cooking demo! This time, she'll explore the world of Pakistani seafood cooking. The menu this evening includes a fish stew made with fresh cod cooked with tomatoes, red peppers, green onions, cilantro, red onion, White Jasmine sajji masala and coconut milk, with a side of crusty bread and a tomato cucumber salad. Space and supplies are limited, so registration is required for this event. 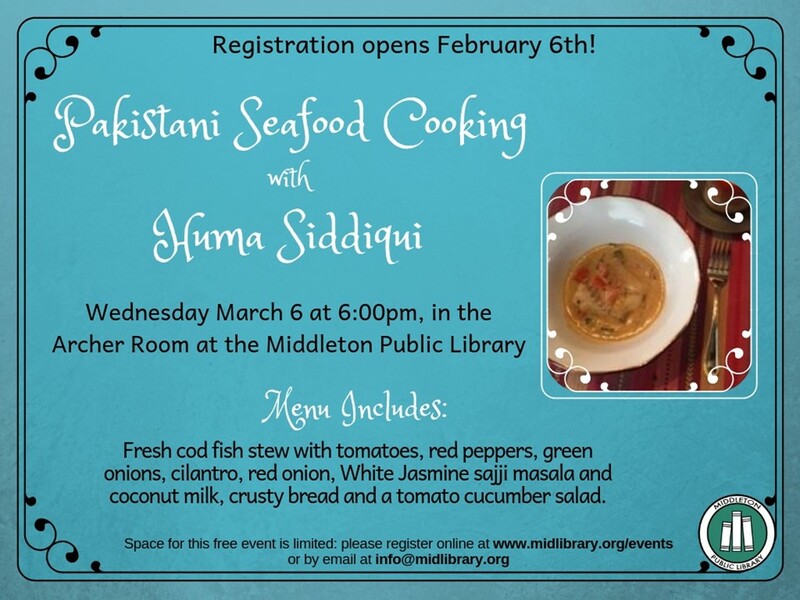 Register online using the link above or email info@midlibrary.org Huma Siddiqui is a mother, accountant, entrepreneur, author, cooking instructor, and former host of ‘White Jasmine Everyday Cooking’ a weekly cooking show on TVW- Ch 14 in Madison, WI. Huma has a passion for cooking great food and bringing family and friends together. She is the author of ‘Jasmine in Her Hair: Culture and Cuisine from Pakistan’ and the president and founder of White Jasmine, a family business based in Mount Horeb that offers gourmet Pakistani-Indian spice blends. For recipes and more, visit www.whitejasmine.com.